Now voters will have another chance, in November 2017 to decide whether they want to hold another one. Constitutional convention expert and SUNY New Paltz Dean Gerald Benjamin says if the “stars align” for approval, it will be largely up to one factor. “The guy who knows that is Preet Bharara,” Benjamin said. Bharara, the US Attorney for New York’s Southern District, convicted former Assembly Speaker Sheldon Silver earlier this month on corruption charges, and is currently prosecuting the former Senate Leader Dean Skelos, and his son, in an ongoing trial. Benjamin believes that if voters approve the idea of holding another convention, it will be because of widespread anger over the continuous scandals. “At a time where we’re very discouraged about state government, we’re offered this moment to push the restart button,” said Benjamin. He says a recent poll found 69% of voters open to the idea. The Do- over could include issues like limiting or banning outside income income for lawmakers, or closing campaign financing loopholes. 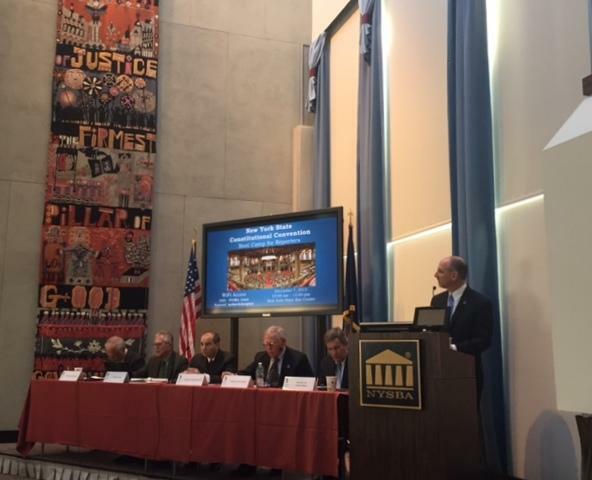 Benjamin spoke at a panel on the Constitutional Convention, organized by the State Bar Association and SUNY’s Rockefeller Institute. Former Assemblyman and senior fellow at the Demos foundation, Richard Brodsky, says if there is another convention, it won’t be motivated by concern about legislative ethics, but by social issues that people care more about, like schools, and pension benefits. He says the state’s constitution has many progressive elements already, like fairer treatment of the mentally ill, and strict rules on land conservation in the Adirondacks and elsewhere. Because of that, he says. the left has potentially more to lose if a convention is held. “The move towards constitutional revision has, in recent years in America, been a right wing concern,” Brodsky said. Benjamin says he’s heard fear of change expressed on both sides. Other issues that could be addressed include revisiting the state’s prohibition on gambling, which is now riddled with exceptions, and deciding whether to include on line fantasy sports gambling. Barbara Bartoletti is with the League of Women Voters. Her group joined other progressive elements in opposing a constitutional convention the last time the vote was held, twenty years ago. The League is still deliberating at this point whether to back the effort in 2017, but she says it needs to be clear that no one group would control the event, and that campaign money would not be a major influence. She says it needs to be “less of an insider, and more of a people’s convention”. If voters approve a convention, the next step is to choose delegates, and that opens a whole new set of issues. Lawmakers are allowed to serve, and under current rules can double dip for salaries and pension credits. The vote on delegate selectin would be held in November of 2018. The panelists, who are not for or against holding a convention, say another factor in whether a constitutional convention ultimately happens , in the spring of 2019, is leadership. Even though the governor of the state does not really have a role in the process, they say Governor Andrew Cuomo could be key to encouraging a yes vote. Cuomo’s father, Mario Cuomo was a champion of holding a convention in the 1990’s, but he left office before the 1997 voter occurred. The constitutional convention was ultimately voted down. Governor Cuomo in 2010 said he was in favor of a gathering, but so far has not championed it actively. The New York state legislature is seemingly back to business as usual, with majority parties holding planning meetings, and the new session set to begin right after the holidays. But as Karen DeWitt reports, there has been little public discussion about a corruption crisis that has led to the two most powerful men in the legislature both on trial in federal court this month. As the former New York State Senate Majority Leader goes to trial and his former counterpart Assembly Speaker is still in court, it has become clear that whatever the outcome, Albany’s ethics is on trial. For the second time in a month, one of New York State's biggest political figures is going on trial on corruption charges.